Editor’s Note: The 2016 National Defense Authorization Act (NDAA) required the Department of Defense to conduct three studies of the future fleet platform architecture needed by the Navy in the 2030 timeframe. The Center for Strategic and Budgetary Assessments (CSBA) was selected to conduct one of the studies. The result is Restoring American Seapower by Bryan Clark, Bryan McGrath, Peter Haynes, Jesse Sloman, and Timothy Walton. Two of the authors – Bryan Clark and Bryan McGrath – preview their findings here. Since the Cold War, the U.S. Navy has followed a well-worn template to deter aggression and respond to crises in the Middle East and the Western Pacific: a “one size fits all” carrier strike group and amphibious ready group. This approach won’t do the job any longer. China and Russia are violating international law and threatening U.S. allies even as ongoing operations in the Middle East are consuming the service lives of the Navy’s ships and aircraft. In response, the Department of Defense has deployed Navy and Marine forces longer and more frequently, creating what Navy leaders are calling a readiness crisis in the fleet. This is exacerbated by a reduction in the fleet’s size from318 ships in 2000 to about 275 ships today. The Navy’s predicament is likely to get worse. The United States will face a more stressful set of security challenges in the coming decade than it has since the end of the Cold War. Although terrorism and insurgency will continue to demand its attention, great powers such as China and Russia will likely become America’s most pressing national security concern over the next 20 years. Even today, Russia and China are pursuing their objectives through aggression just below the level of violence that would justify U.S. retaliation. As their capabilities improve, Russia and China may act more aggressively to tilt the balance of power in their favor and – in doing so – revise regional security arrangements. Russian and Chinese weapons also continue to proliferate to regional powers such as Iran and North Korea, themselves longstanding threats to U.S. national security interests. The U.S. Navy is not prepared for a return to great power competition or to contend with the growing capability of regional powers. The emerging strategic environment requires a fleet with higher capacity, new capabilities, a different posture, and more flexible training and readiness processes. The U.S. military of 2030 probably will not be able to follow today’s strategy and mission priorities. Specifically, in the face of growing competition from Russia and China, U.S. forces will likely continue their ongoing shift away from counter-insurgency and counter-terrorism missions toward conventional deterrence operations. We see this shift in mission priority underway today. The Department of Defense is accepting more gaps in Middle East aircraft carrier presence to sustain a carrier operating in the Pacific. The Army and Marine Corps are building warfighting concepts and capabilities to improve their ability to fight highly capable state adversaries after a decade of focus on counter-insurgency and counter-terrorism. And the Air Force is pursuing a light attack aircraft for permissive environments so it can focus the bulk of its combat forces on higher-end conflict. Making conventional deterrence a priority for naval forces will have significant implications for fleet architecture. Most importantly, the current U.S. approach to deterrence relies on an overwhelming response after aggression occurs, as demonstrated in Iraq, Kosovo, and Afghanistan. This approach is not likely to be effective against great powers in the future. The potential objectives of their aggression – Taiwan or the Senkaku Islands for China, or the Baltic States for Russia – are close to their territories and could fall rapidly to an assault. Meanwhile, networks of long-range sensors and missiles could delay a subsequent U.S. response. By the time American forces arrive, the fight could be over. Overturning the resulting new status quo may then prove unpopular with the international community. Instead of threatening to respond after the fact, conventional deterrence in the 2030s will require U.S. and allied forces that can deny or delay aggression where and when it occurs. As during the Cold War, this approach to deterrence will require a new posture that places U.S. forces forward near potential objects of aggression and able to act quickly and proportionally against attacks. Naval forces have an obvious role to play here. Naval forces can sustainably operate in proximity to potential targets of great power aggression without the provocative footprint ashore needed to support and protect ground forces. Ships at sea can maintain a persistent posture in a region rather than being episodically projected from outside the theater like air forces. Moreover, naval forces can operate in a wide range of self-sustaining force packages from carrier strike groups to surface action groups, offering scalable responses to commanders. The imperative to immediately deny or delay aggression, rather than respond to it after the fact, suggests today’s fleet must adopt new operating concepts and capabilities that enable naval forces to fight in highly contested environments near an adversary’s territory or likely objectives. These concepts will leverage technologies and programs that are currently at the demonstration or prototype stage and likely to be deployed in the fleet of 2030. Given the focus of potential adversaries like Iran, Russia, and China on long-range missiles and sensors, new concepts for missile defense and countering enemy intelligence, surveillance, and reconnaissance (ISR) will be essential. These new approaches should seek to increase the time and number of weapons needed to target and defeat distributed naval forces in detail. This would require the aggressor to slow its offensive or accept the risk of being stopped by attacks from U.S. ships, aircraft, and submarines. Submarine-launched anti-ship missiles are some of the most challenging, demanding new concepts for anti-submarine warfare that prevent submarines from getting close enough to launch a missile attack. These concepts will need to increase the Navy’s reliance on active sonar, distributed unmanned sensors, and standoff or air-delivered weapons to suppress enemy submarine operations. Offensively, U.S. undersea forces will need to exploit advances in unmanned undersea systems, including mines, to conduct attacks against targets at sea and ashore. The Navy, however, cannot shift all missions undersea in the face of improving enemy sensors and missiles. Submarines and unmanned undersea systems do not provide a visible posture for deterrence and carry small payloads that may not be enough to stop enemy aggression. This is where new and upgraded surface warships come in. They will bring the necessary volume of fire to the fight against enemy surface ships, islands, and shore facilities. However, U.S. surface combatants will need to operate in a distributed manner and increasingly employ passive and networked fire control approaches to find targets without themselves being targeted. The Navy and Marine Corps will also need to employ new approaches for amphibious operations. In the South China Sea or Persian Gulf, small temporary bases may be more survivable than ships or aircraft. Small bases can be dispersed in terrain or under foliage and use short-range air defenses, camouflage, and decoys to increase the number of weapons needed to defeat them, like what China itself is doing on islands in the South China Sea. Marines could hide anti-ship and anti-air missile systems on small coastal bases in places like the Philippines, Japan’s Southwest Islands, or Oman to threaten an enemy’s fleet and aircraft and slow down its aggression. 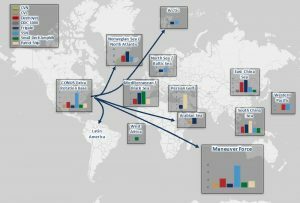 These operating concepts, along with new approaches to logistics and sustainment, will require new force packages composed of ships, aircraft, and unmanned systems that combine current and new platforms and capabilities. The larger number of force packages needed will be more expensive and time-consuming to train and prepare for deployment than today’s force, but this investment is necessary to create a fleet that can fight under fire in a highly contested environment. Conventional deterrence in the 2030s will rely on naval forces being able to convince an adversary that its aggression may not be successful, or delayed long enough for joint and coalition forces to eventually defeat it. Navy and Marine ships, personnel, and aircraft will need to be postured forward where they can conduct high-capacity strikes and surface attacks to stop an enemy’s aggression on short notice, with additional forces nearby that can continue fighting until allies or other U.S. forces arrive. Today’s naval posture does not have these characteristics. The Navy maintains one carrier strike group and an amphibious ready group in the Pacific and Middle East, with individual submarines conducting ISR missions and destroyers supporting missile defense around the world. Although carrier strike groups can sustain combat operations almost indefinitely, they will need hours to generate enough sorties to equal the strike capacity of one destroyer when needs for air defense and tanking are considered. And early in a conflict, before enemy ISR and strike capabilities are degraded, carrier operations can be suppressed by even unsuccessful enemy missile or torpedo attacks. The need to protect aircraft on deck, frequently maneuver, and employ countermeasures will slow down the rate at which carriers can initially launch sorties. Surface combatants and submarines, in contrast, use missiles for anti-ship strikes, enabling them to mount large-scale attacks with hundreds of missiles within minutes. They also have smaller physical and radiofrequency signatures and can operate effectively even as they evade detection and attack. They are more suited for the initial phases of combat against great powers than today’s carrier strike groups. Surface combatants and submarines, however, will quickly expend their weapons and need to be reloaded away from the fight. To best employ each element of the naval force, our proposed fleet architecture separates the deployed fleet into two sets of forces: First, deterrence forces centered around surface combatants, submarines, and unmanned systems are postured forward in specific regions, such as the South China Sea or Persian Gulf, where they can conduct high-volume offensive operations on short notice in wartime. Second, a single maneuver force centered around two carrier strike groups would operate across the greater Indo Asia-Pacific region, enabling it to augment deterrence forces during a conflict and sustain combat operations indefinitely after these run out of munitions or are damaged and must withdraw. This map shows the apportionment of forces to each region proposed in the CSBA fleet architecture. This approach improves the ability of the fleet to train, adapt and innovate, and would enable strategies, such as “Forward Partnering,” that are designed to strengthen the combined capability and proficiency of U.S. and allied forces. Deterrence forces will specialize in their regions, enabling them to become experts on local allies, adversaries, threats, and opportunities. To help them maintain their proficiency, deterrence forces will deploy for six months each year, like today’s forward-based naval forces. The carrier strike groups of the maneuver force will not be tied to a specific region as they are today and will deploy for seven to eight months every three years like today’s carrier strike groups. This will provide them time to train and prepare for the wide range of possible scenarios they may encounter across the Indo-Asia Pacific, including conducting large-scale experiments to develop new operational concepts to include integrated, multi-carrier air wing operations. To support this new deployment construct, our proposed fleet architecture calls for more forward-basing of ships at allied ports overseas, building on current Navy homeports such as Yokosuka, Japan and Rota, Spain. It also envisions an expanded use of forward-stationed warships such as frigates and corvettes and unmanned vehicles that use rotational crews. Together, the new force packages, deployment construct, and basing we propose will cohere into a posture that is better suited for great power competition, deterrence, and reassurance than the fleet that would result from the current Navy shipbuilding plan, or from the Navy’s new 355-ship fleet. Although the new fleet requirement would address some of the Navy’s current capacity shortfalls, it would largely keep today’s force packages, operating concepts, and posture. 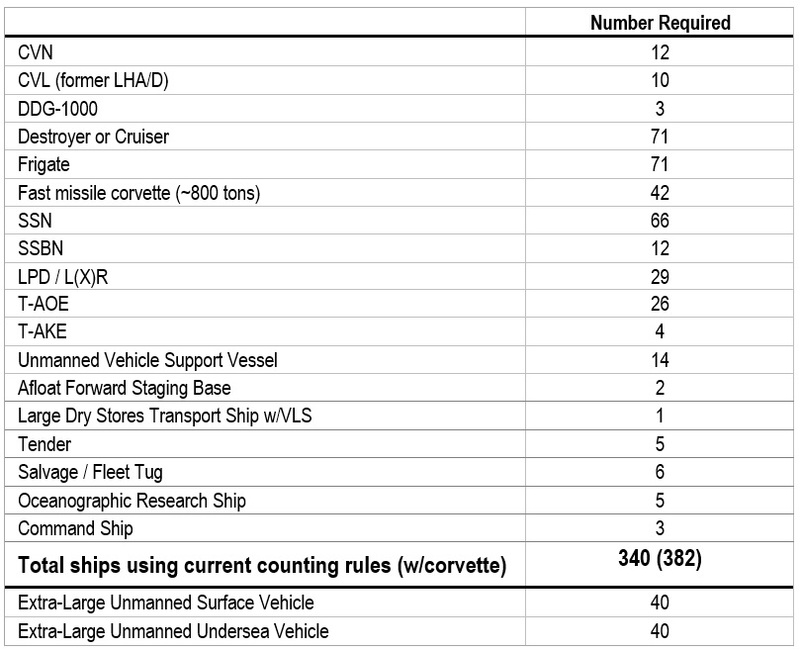 The number and type of platforms needed in the future fleet result from the number of ships and aircraft deployed and their deployment cycle. For example, attack submarines generally deploy for six of 24 months and have an overhaul once every eight to ten years. Therefore, four or five attack submarines are needed to sustain one deployed. The Navy must also consider the surge capacity needed in wartime, which can usually be met by non-deployed forces that are not in deep maintenance. We determined the below major platforms will be needed in the fleet of the 2030s (aircraft are addressed separately). This fleet enables more distributed surface operations in wartime, more proportional responses to provocations short of actual conflict, and more robust peacetime engagement compared to the Navy’s plan. It ensures that each surface vessel can conduct offensive strikes and anti-ship attacks while defending itself until it has expended its weapons as part of deterrence forces. The CSBA architecture also provides open-ocean frigates that can defend escorted convoys and logistics ships from both air and submarine attack. We largely agree with the Navy’s current requirement for size of the amphibious fleet, but would reconfigure it intofour-ship amphibious ready groups and change amphibious assault ships into light aircraft carriers for the F-35B. This will provide more long-range fires for amphibious operations and provide fixed-wing air operations in the deterrence forces. Any conversation on the future of the fleet would be incomplete without a discussion of logistics. A larger and more dispersed fleet cannot be accommodated by today’s logistics force. The Navy’s current and planned fleet includes about 19 oilers and 14 cargo ships. Our analysis, using models developed by the Center for Naval Analysis, found this to be the wrong balance. The Navy needs more refueling capabilities in the deployed fleet, especially as it operates in a more distributed manner. Our fleet architecture exploits the growing capability of unmanned systems to expand the reach and persistence of manned platforms, and to entirely take on some missions such as ISR and mine warfare. In addition to 80 large unmanned undersea and surface vehicles that can deploy from a pier, our architecture includes a range of smaller unmanned systems carried or deployed by ships or from shore to execute the new operating concepts referred to above. Building and sustaining a fleet able to effectively compete with other great powers will be more expensive than today’s force that efficiently sustains naval presence overseas. 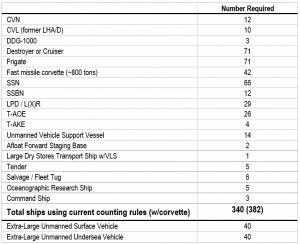 Everything we propose will cost about 18 percent more to build and 15 percent more to operate and maintain than the 308-ship fleet described in the Navy’s than the Navy’s FY17 Shipbuilding Plan. The U.S. shipbuilding industrial base could deliver this fleet by the 2030s, but the new fleet architecture will likely require additional investment in the suppliers who build component systems and equipment. The Navy’s concept and doctrine development organizations will need time and funding to refine and integrate new operating concepts into the fleet. And Combatant Commanders and embassies will need time and leadership attention to gain the agreement of host nations to new basing and posture arrangements. The Navy, however, must invest the time, money, and effort. Resurgent powers such as China and Russia seek to revise the international order, and with it the advantageous position of the United States in security, trade, finance, and diplomacy. Unless America competes effectively and deters aggression by these adversaries, it risks undermining its alliances, and with them, the way of life Americans expect to continue. Bryan Clark is a Senior Fellow at the Center for Strategic and Budgetary Assessments. Bryan McGrath is Associate Director of the Hudson Institute Center for American Seapower and Managing Director of The FerryBridge Group.